The Congregation of the Franciscan Sisters of the Heart of Jesus was founded in Gozo in 1880. It had its origin in the Association of the Twelve Stars of the Heart of Jesus, initiated at Rabat, Gozo by a group of young girls whose Spiritual Director was Fr. Joseph Diacono. He set about transforming this association into a diocesan religious congregation, at first known as Franciscan Tertiaries and later Franciscan Sisters of Malta. In time, this congregation was given Papal approval and to express its charism better, the name was changed to Franciscan Sisters of the Heart of Jesus. 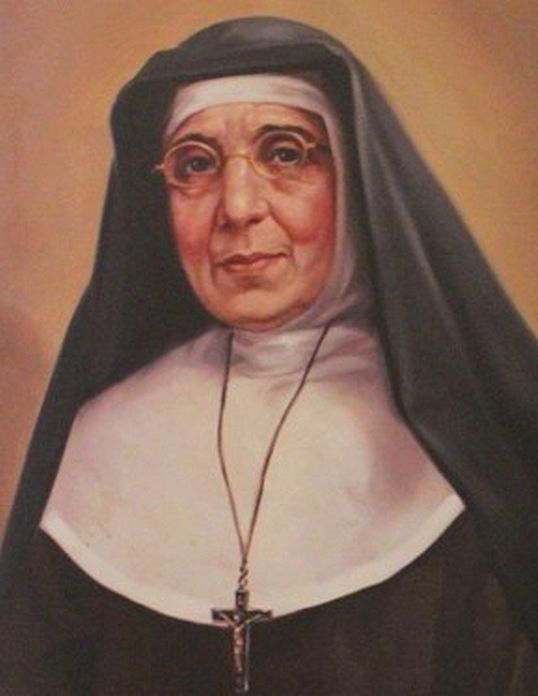 While Fr Diacono started the congregation there was also Mother Margherita De Brincat, who through a divine disposition, let it on, cultivated it and brought it to maturity. Mother Margherita De Brincat formerly known as Virginja De Brincat was born in Kercem Gozo on 28th November, 1862. At the age of 27, inspired by the Holy Spirit, she decided to run the congregation on her own inspite of many difficulties. Her hard and faithful work resulted in the expansion of the same Congregation around the world. 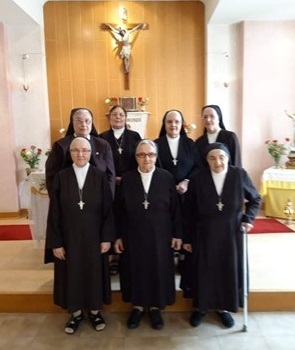 In today’s world one can find the Franciscan Sisters of the Heart of Jesus working incessantly in Corfu’, Ethopia, Kenya, Italy, London, Australia, Israel, Pakistan, Brazil, Jerusalem, Philippines and last but not least in Malta and Gozo. The Franciscan Sisters of the Heart of Jesus receive the divine gift of the religious vocation, commit themselves to live the Gospel in the Spirit of St. Francis of Assisi and follow in the footsteps of Fr. Joseph Diacono and Mother Margherita De Brincat, inspired by the Eucharistic Heart of Jesus. After only 5 years that the congregation had been officially formed, Mother Margherita De Brincat had been asked by Lady Hutchinson to open a house in Birkirkara. 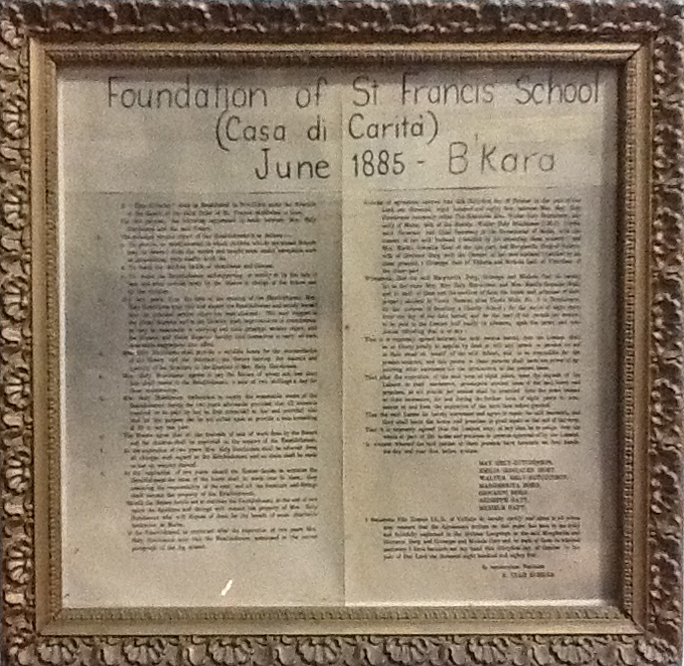 Thus in 1885 the religious order of the Franciscan Sisters of the Heart of Jesus started the process of teaching young girls how to read, write and work arithmatic, together with Catholic teaching in Birkirkara. Eventually this house has developed into a school and it kept growing in population and size ever since. To date it is still a convent school, run by the Franciscan Sisters, following the charisma of the now Venerable Mother Margherita De Brincat, and continuing to serve the dynamic needs of its learning community Always Better. A ‘Casa di Carita’ shall be Established in Birkirkara under the direction of the Sisters of the third Order of St. Francis established in Gozo. For this purpose, the following agreement is made between Mrs. Hely Hutchinson and the said Sisters. To provide an establishment in which children who do not attend Schools may be rescued from the streets and taught some useful occupation such as lace-making, plain-needle work etc. To teach the children habits of cleanliness and tidiness. To make the Establishment self-supporting or nearly so by the sale of lace and other articles made by the Sisters in charge of the School and by the children. For two years from the date of the opening of the Establishment Mrs. Hely Hutchinson may visit and inspect the Establishment and satisfy herself that the principal secular object has been attained. She may suggest to the Sister Superior and to the Director such improvements or amendments as may be reasonable in carrying out such principal secular object, and the Director and Sister Superior herby bind themselves to carry all such reasonable suggestions into effect. Mrs. Hely Hutchinson shall provide a suitable house for the accommodation of the Sisters and the Scholars; the Sisters leaving the amount and quantity of the furniture to the direction of Mrs. Hely Hutchinson. Mrs. Hely Hutchinson agrees to pay the Sisters of whom not less than four shall reside in the Establishment, a sum of two shillings a day for their maintenance. Mrs. Hely Hutchinson undertakes to supply the reasonable wants of the Establishment during the two years aforesaid provided that all accounts required to be paid by her be first submitted to her and provided also that for this purpose she be not called upon to provide a sum exceeding £20 in any one year. The Sisters agree that all the proceeds of sale of work done by the Sisters and the children shall be expended on the support of the Establishment. At the expiration of two years Mrs. Hely Hutchinson shall be relieved from all charges with regard to the Establishment and no claim shall be made on her on account herself. At the expiration of two years should the Sisters decide to continue the Establishment the lease of the house shall be made over to them, they assuming the responsibility of the rent, and all the furniture and fittings shall become the property of the Establishment. Should the Sisters decide not to continue the Establishment at the end of two years the furniture and fittings will remain the property of Mrs. Hely Hutchinson who will dispose of them for the benefit of some charitable Institution in Malta. If the Establishment be continued after the expiration of two years Mrs. Hely Hutchinson may visit the Establishment mentioned in the second paragraph of the Agreement. That it is expressly agreed between the said parties hereto, that the Lessees shall be at liberty jointly to appoint by deed or will any person or persons to act in their stead on behalf of the said School, and to be responsible for the present contract, and this person or those persons shall have the power of appointing other successors till the termination of the present lease. That after the expiration of the said term of eight years, upon the request of the Lessees or their successors, protempore another lease of the said house and premises, at six pounds per annum shall be executed unto the same lessees or their successors, for and during the further term of eight years to commence at and from the expiration of the term then before granted. That the said Lessees do hereby convenant and agree to repair the said tenement, and they shall leave the house and premises in good repair at the end of the term. That it is expressly agreed that the Lessees may, at any time let or assign over the whole or part of the house and premises to persons approved of by the Lessees. In witness whereof the said parties to these presents have hereunto set their hands, the day and year first before written. I Benedetto Ullo Xuereb LL.D. of Valletta do hereby certify and attest to all whom may concern that the Agreement written on this paper has been y me truly and faithfully explained in the Maltese Language to the said Margherita and Giovanni Borg and Giuseppe and Michele Gatt and to each of them in whereof testimony I have hereunto set my hand this thirty-first day of October in the year of Our Lord one thousand eight hundred and eighty four.